The square posts Nylofor are galvanised and plastic coated, with inserts to fix the panels on the posts by means of special fixing system. Green (RAL 6005), white (RAL 9010) and black (RAL 9005). 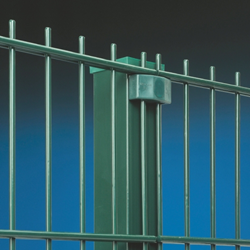 In total Betafence offers 7 Classic colours and 3 Prestige colours (metallic or structural coatings). More and other colours out of our RAL Collection are available on request. When installing Nylofor square posts in a concrete wall, it is necessary to make sure that water is not able to remain inside the post.